Multiboxing is strictly forbidden in Dynamis. It can crash your client and/or bring the server down. Do not one-shot statues. NMs are spawned so pop items are not used. You must attack Statues in order to spawn the necessary NMs to complete Dynamis. Clear statues in front of Mog House area. Clear statues on upper level, east of Quadrangle. Clear statues on upper level, south of Quadrangle. Clear statues on upper level, west of Quadrangle. Clear statues on upper level, north of Quadrangle. Clear statues at Auction House area. (Optional) Defeating Goblin Statue 210 will respawn enemies at the Auction House. Clear statues in palace interior. Clear statues north of the palace. Defeating Goblin Statue 293 causes enemies to respawn inside the palace and at the zone to Upper Jeuno (including boss). 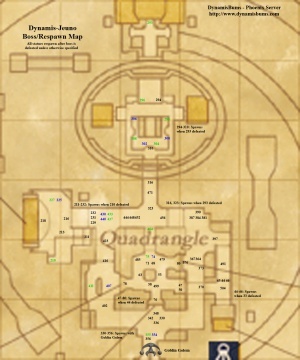 These areas should be cleared of players prior to clearing the Statue to avoid aggro. Clear respawned statues in palace interior. (Optional) Clear statues in Quadrangle, lower level, starting from the Mog House area. Defeating Goblin Replica 33 will cause Goblin Statue 44 and Replicas 45-46 to respawn at Mog House; this area should be cleared of players to avoid aggro. (Optional) Clear respawned statues at Mog House area. 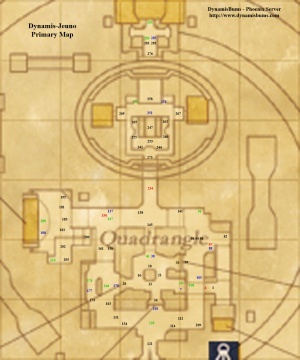 Defeating Goblin Statue 44 causes enemies to respawn in the Quadrangle; this area should be completely clear of players (aggro of a single statue will link the entire area). (Optinal) Clear respawned statues in the Quadrangle, lower level. Camp northwest of Upper Jeuno zone. Camp should be south far enough to avoid aggroing respawning statue 402. Pull and defeat Goblin Replicas 342, 348, 336, 330 WITHOUT linking Goblin Replicas 354-356 and Goblin Golem. It is possible to kill all statues at once with coordinated series III -ga, however, this requires the alliances to be able to deal with one Vanguard of each job and an additional BST, along with their pets (16 Vanguard total). A player with increased movement speed pulls and kites Goblin Golem through previously-cleared areas. Additional mages will be required to sleep spawning Vanguard from linked statues. Movement speed is imperative to outrun Goblin Golem's ability to cast Death. Defeat spawned Vanguard from Goblin Replica 356, including NM Kikklix Longlegs (MNK). 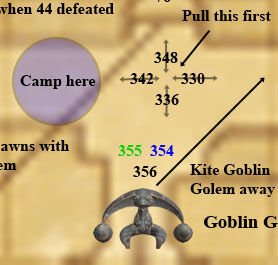 Goblin Replicas 354 and 355 can be defeated at strategic times to restore HP and MP. They should be kited until it is necessary to do so OR 354-356 can be killed by BLMs using coordinated series III -ga, without hitting the Goblin Golem. Defeat Goblin Golem. Alliances should be camped closer to the Upper Jeuno zoneline to avoid respawning statues 370 and 402. Defeating Goblin Golem grants a 30-minute time extension. Vanguard's Slimes cast Paralyga often. Slimes should be Slept and and Silenced away from the main alliances while fighting other Vanguard. Vanguard's Slimes should be killed using a sleep-nuke strategy to avoid damaging AoE (eg., Fluid Spread) while melee focus on other Vanguard. Goblin Golem (Zone Boss) is spawned by defeating Goblin Statue 293, north of the Palace by the Duke's Manor. This page was last edited on 13 August 2017, at 03:04.